We've written a fair bit about Smarty SIM only deals since it launched. That's because it just keeps on coming up with great offers that we want to tell you about. Around two months ago, we got excited because Smarty Mobile added an unlimited data SIM to its narrow but competitive range of tariffs. Not many networks offer all-you-can-eat, so it was notable anyway. But what we really loved was the price - only £25 per month - and the fact that you could get it on a rolling contract of 30-days each, so you wouldn't be tied in to it for a year or more. And now Smarty has made that even better by throwing a tempting little freebie into the mix, too. Grab its unlimited data SIM any time by May 8 (and activate it by May 22), and Smarty will send you an Amazon.co.uk Gift Card worth £20 within a month of purchase. So although you'll be unlikely to have it in time to splash on Amazon's Spring Sale, we very much doubt you need us to tell you about aaaaaaaaaall the things it will allow you to buy beyond that. 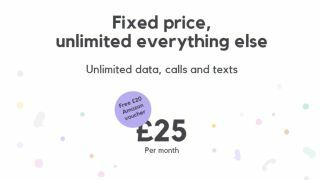 Smarty may not have the UK's cheapest unlimited data SIM only deal (Three has that honour at the moment at £24 per month), but it certainly isn't far off. And the key selling point for Smarty, which actually piggy-banks off Three's coverage anyway, is that you're only committed to 30 days at a time. You can find out even more about the provider by heading to our dedicated 'What is Smarty Mobile?' explainer. And if you're wondering about the Ts&Cs of this Amazon voucher deal, they can be found on the Smarty site, here. The main emphasis is that the reward is not redeemable in conjunction with any other offer or promotion..